Nižinskyj | Conservative Political Comment: When did elitism get such a bad name? Ken Clarke & Lord Judge: did public school make them better or worse at their jobs? I am an elitist. There, I said it. More than any other label - whether it be liberal, Conservative, Thatcherite, or libertarian - this word defines what I most believe in and strive for in politics. In my opinion, elitism is a key factor in what makes civilisations great, what enables them rise to the highest pinnacles of knowledge, scientific progress, enlightenment and - crucially - good governance. It is, however, a highly misunderstood and much-abused term. Particularly to those on the left, it has come to mean entrenched privilege - the reservation of certain positions of authority to a narrow slice of society on the basis of high birth rather than ability. It has become a term of abuse and derision that, like many Marxist ideas, has begun to poison the political mainstream. But this is not what elitism means and I am fairly confidant in my assertion that such a situation no longer exists in the United Kingdom. Indeed, the horrific outcome of leaving an army solely in the hands of incompetent and sometimes insane aristocrats during the First World War soon put pay to the last remnants of that eighteenth century system. And, as the twentieth century progressed, more and more was done to ensure the highest, most important and most demanding offices of state were reserved for the most able and highly educated - whatever their origins. One of the most visible manifestations of this was grammar schools - institutions, enshrined in the 1944 Education Act, which educated the most intellectually able 25% of the population on the basis of an examination rather than high birth or ability to pay. That is elitism. Those who support grammar schools and lament their passing argue they were powerful tools against smashing entrenched privilege - throwing open access to Oxford and Cambridge for the brightest among the working classes and enabling them to rise to occupations and social standing far above their birth. Edward Heath, Margaret Thatcher, William Hague and Michael Howard are notable success stories. So, naturally, I was horrified by Wednesday's cover of The Times, which reported - and supported - the notion put forward by 'leading figures' that English judges were 'too male, too white, too elitist.' In this context, 'elitist' was taken to mean the 'stranglehold' of those who had risen to the profession from successful advocacy at the bar and, earlier in life, from excellent academic institutions - quoting the figure that 75% of judges went to private school while 81% attended either Oxford or Cambridge universities. I don't want to speculate on how much the first figure may have resulted from the decline of grammar schools but, concerning the second, shouldn't we be glad the majority of judges come from our two greatest universities? Isn't that what they're there for - to produce the brightest and best? And, personally, I can think of no more appropriate place to find future judges than the bar. The central fallacy in all the arguments put forward, however, is that they all accept the current judges are doing an excellent job. Neither Lord Falconer, Lord Collins nor The Times argue that a more 'diverse' judiciary would do it any better. The Times leader, for example, is unequivocal: 'The current ranks of the judiciary include some of the best minds of a generation' yet still nods in agreement that judges ought 'to look and sound more like the people coming up in front of them'. Lord Falconer, too, perfectly encapsulates the idiocy behind the whole argument by opening his column with: 'Our judges are honest and of high quality. But they do not reflect the society they judge'. Through the entire newspaper, not one person gives a rational reason for why the composition of the judiciary ought to change. They push for it merely for the sake of it; because, in the lexicon of today's establishment, the words 'diversity' and 'representative' have become synonymous with 'good' while 'elitism', 'white' and 'male' have come to represent all that is evil. One would hope sense will be seen before any real damage can be done. 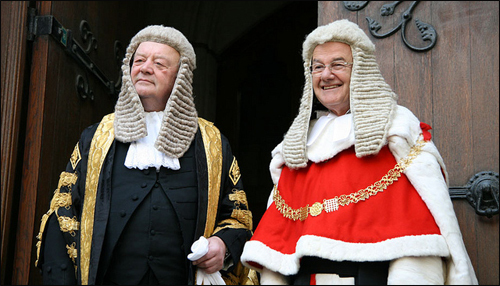 Baroness Jay, who is chairing the inquiry into just why the judiciary is staffed by such highly-educated and successful judges, appears to subconsciously agree with me, writing: 'The judiciary is one of the three power bases on which our whole system of government depends. But a judiciary is only as good as the people appointed to its most senior positions.' I can think of no better reason to keep things exactly as they are, your ladyship. You perpetuate a rather tired argument that the contemporary notion of the elite is some how Marxist, I am sorry but your argument is weak and lacks any empirical foundations what so ever, you also make no reference to any literature to substantiate your claims. Far from being a Marxist term it is used by proponents of meritocracy, who believe that ones ability to pay for education should not dictate ones chances in life. One third of all MPs went to private school, and when one considers that the private sector represents only 7% of the education sector these individuals are prospering due to their ability to pay for a top class education. It is their parents wealth not their natural ability that dictates this. This blog has so many tired clichés in it; it succinctly frames why the conservative party did not win a majority at the last election; tired, anachronistic ideas lodged in the distant past. Whether you like it or not the world has moved on, and if you cannot understand why there needs to be an equal amount of women as men in Parliament you will only damage the conservative party with your views. The conservative party has never won a general election without a majority of female voters, which they are now losing due to economic conditions which are resulting from the coalitions policies. Only the none elite can be elitist. If you are elite then where do you go for your inspiration? Jeff, are you suggesting the public sector is unable to offer a top class education? If that's true, it's a shame, but I hardly see how the existence of private schools affects this. And, until the public sector catches up, if you've got the money for a better education, you pretty much owe it to your children to pay for it. Whether or not a third of MPs were privately educated and whether or not their skills comes from 'natural ability' is beside the point - by your admission (however accidental) only the private sector can offer 'a top class education'. Surely you sleep easier at night knowing at least a third of MPs are excellently educated? And, last time I checked, references to literature aren't used all that often in newspaper comment pieces are they? This is my opinion, not a thesis. Unsurprisingly, Eton's headmaster agrees with me.